HostGator with Free SSL?! Hosting Site on HTTPS with "Let's Encrypt"
This is how to host your site on HTTPS for free, with the popular and trusted Let’s Encrypt (or LetsEncrypt) SSL certificate authority in 2019 for HostGator users. Update! 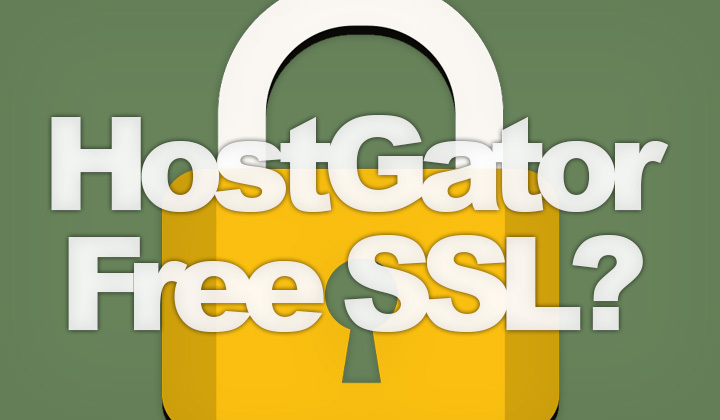 HostGator has announced free SSL support in June 2018. HostGator still provides reasonable priced, commercial SSL certificates. But be warned! After sign up, cost of SSL is $39.99/year or more. Better sign up with HostGator on a cheaper $19.95/year SSL certificate. Nowadays many hosting providers support LetsEncrypt SSL which is as secure, and valid as basic commercial SSL certificates. Offering significant savings in cost. In my opinion the best HostGator alternative with free SSL is FastComet. Besides being a quality hosting company they provide so many advantages over HostGator of which free HTTPS hosting is just the tip of the iceberg. Free site migration — Move websites to FastComet for free, with their migration service. Get dedicated support and all sites are allowed, not just WordPress. Free domain for life — You can register a new one, or transfer your old domain name over to FastComet for free and keep it there for life with no added cost. Flat, transparent pricing — No price hikes, increased cost on renewal or selling of additional services. FastComet provides simple, low pricing for life. Free & Easy Let’s Encrypt — Enable the free LetsEncrypt SSL certificate with an easy 1-click interface. It will instantly secure all of your sites. Click here for a 14-day fully featured free trial of FastComet hosting. First of all, HostGator doesn’t support SSL at all on their cheapest “Hatchling” plan. The choice is to either opt-in for the higher level “Baby” plan and purchase a commercial SSL with it. Or you can get the highest level “Business” web hosting plan, which includes the certificate and dedicated IP for free. If you choose to add the SSL add-on during sign up, the “Baby” plan will be the most affordable option to host on HTTPS with HostGator. In theory, you can use all kinds of SSL certificates, even custom ones. Also, HostGator supports so called self-signed SSL certificates, which are completely free, and can be configured and installed in the hosting control panel. But they will trigger a browser warning and are not secure. When asking for Let’s Encrypt support from HostGator, the usual response is that you can install a third-party certificate for a one-time fee of $10/per website. However, LetsEncrypt SSL is valid for 3 months at a time, so having them manually install it every three months is an impossible task. Companies that truly support it, have automatic certificate renewal that is completely automatic and hands free. There has been plenty of talk about HostGator and their support for Let’s Encrypt, but as with most Endurance International Group (EIG) owned hosting companies, no support is being planned. Future will tell, but they are unlikely to easily give up their huge business and profits in commercial SSL certificate sales. Thanks for reading. Any questions on free SSL & HTTPS hosting? And please, share your experience with HostGator with us. Also I want to make it clear to my dear readers, that some of the posts have affiliate links in them. Your support is voluntary but badly needed. Thank you. You could have mentioned Cloudflare, which is what I use to get free SSL on my Hostgator-hosted domains. Incredibly easy setup (you just sign up and change your name servers in your domain control panel) and works flawlessly. Provides lots of other tools as well, besides SSL. Great comment Magnus. The reason I haven’t mentioned Cloudflare, is that this solution requires the use of their Flexible SSL option, which is quote; “not recommended if you have any sensitive information on your website”. This is because the connection between HostGator and Cloudflare is not secured, without a commercial SSL certificate on the server side. Secondly I’d like to note, that HostGator has dropped support for Cloudflare through cPanel. So it’s not as easy to setup as it used to be.